This is a test post from the free BlogBooster app. 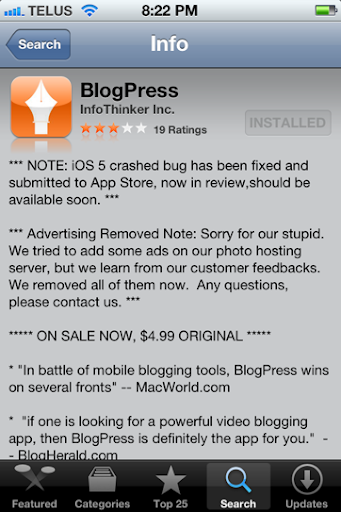 Normally, I remote blog with BlogPress, but ever since iOS 5, it's been broken. That message about a fix submitted to the App Store has been there for 3 weeks. Sure, it's a First World Problem, but I did pay $3 for the app. It would be nice if it worked. So, with a trip Stateside next week, I need a new blogging app. The official Blogger app isn't robust enough for my needs. But this little app seems to be doing the job so far. Hooray for me!